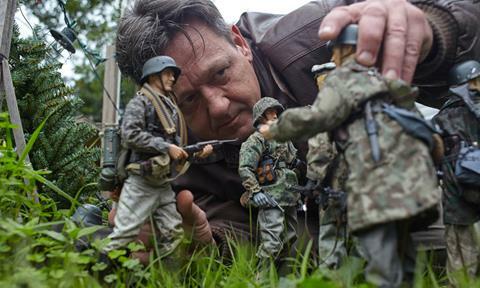 Image: Mark Hogancamp carefully poses his figures for a scene where the Nazi SS carry US weapons as they walk into Marwencol. 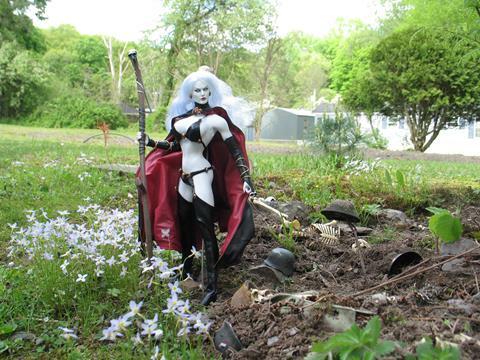 Photo credit: Jeff Malmberg. In 2004, photographer David Naugle stopped to make conversation with an odd character he had noticed around his small upstate New York town. 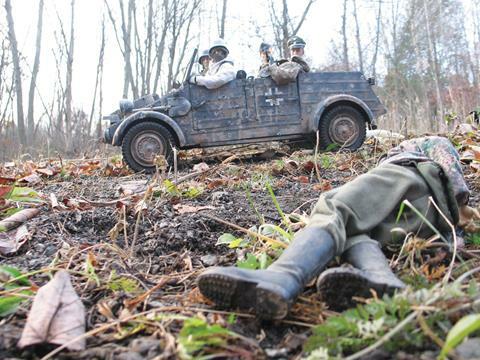 Dressed in a vintage WWII US-army uniform, the man could often be seen walking unsteadily along the shoulder of the rural country roads, dragging a realistic scale-model army jeep behind him. The man, whose name was Mark Hogancamp, shyly explained to Naugle that he was aging the tires on the jeep so that his photographs would look more authentic. Naugle was intrigued. 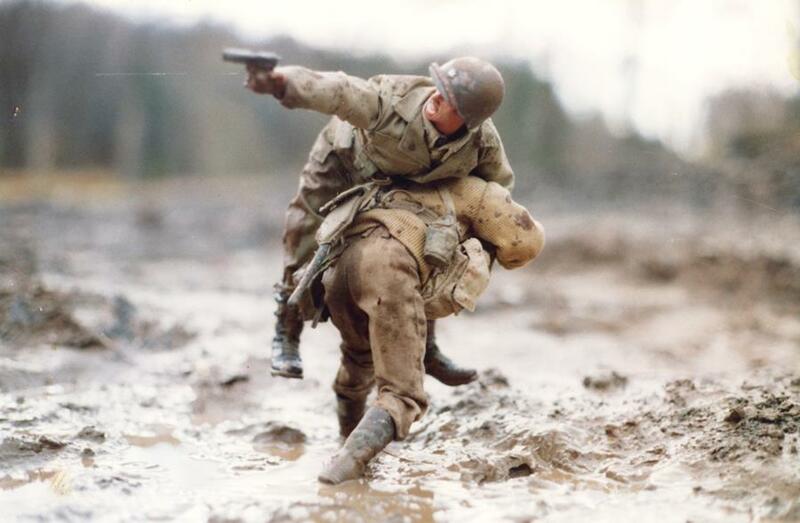 A few days later, he received a package from Hogancamp: a bundle of loose snapshots of intensely-imagined, intricately detailed scenes of war, love, anguish, vengeance and rescue – all at 1:6 scale. The photographs revealed a cinematographer’s eye for framing, a screenwriter’s ability to capture the essence of dramatic conflict, and a director’s vision of a fictional world made absolutely real. The story behind why Hogancamp made these compelling images was even more extraordinary. Four years before, On April 8, 2000, Hogancamp had spent the evening, as he usually did, at his favorite bar. After a stint in the Navy and a marriage that went sour, Hogancamp was basically a homeless alcoholic and, as he now puts it, “pretty much useless to everyone around.” That evening, though, he’d made some new friends: five young men, who seemed to like him and encouraged him to open up about his life. With ill-advised candour, Hogancamp revealed his secret passion for wearing women’s shoes. When he left the bar, stumbling drunk, the men had been lying in wait for him. They attacked him, brutally beat him, viciously stomped his face against the asphalt street, and left him for dead. All because they erroneously believed him to be gay. Above series of 3 images: Image credit: Mark Hogancamp. Above image: To The Rescue, made for a photo contest and inspired by Forrest Gump’s carrying of Lt Dan. Image credit: Mark Hogancamp. Hogancamp spent nine days in a coma. When he awoke, he remembered nothing of the attack. In fact, he had near-total amnesia. He couldn’t remember his own life. He couldn’t remember his marriage. He had no memory of the touch of a woman. He also had no memory of why he ever wanted to drink. “As far as I knew, I was born on that day”, he now says.